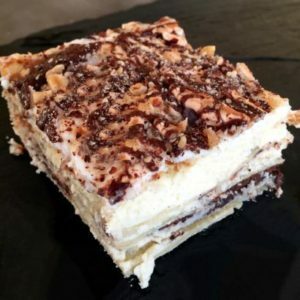 Shavuot is one of those culinary centric holidays where everyone is trying to outdo everyone else with crazy over the top dairy recipes and anyone who is lactose intolerant gives a heavy sigh and reaches for Lactaid. In a bowl mix 3 egg yolks and 3 tablespoons of water and set aside. In the bowl of an electric mixer cream together the mascarpone cheese, 5 egg yolks, and powdered sugar. Mix until combined (about 2 minutes) and set the mixture aside. Brush the outside edges (about ½ inch) of the puff pastry sheets with the egg wash (about ½ inch all the way around).Take a scoop of Nutella and spread it on the puff pastry (keep it away from the edges). Gently place another piece of puff pastry on top, lining up the edges. Brush the egg wash around the edges of the puff pastry. Take a scoop of mascarpone mixture and spread evenly over the top of the pastry sheet, staying away from edges. Repeat, alternating mascarpone, and Nutella, until the top layer is just the puff pastry. Press the edges together to make sure that the filling between the layers is sealed all the way around and that there is no leaking. Brush the top with egg wash, sprinkle the chopped hazelnuts over the top and bake 25 to 35 minutes until the pastry has puffed and turned golden brown. Serves 8 to 10. Serve hot and dust with powdered sugar. Adapted from and modified from ‘Joanne Trattoria Cookbook: Classic Recipes and Scenes from an Italian-American Restaurant’ by Joe Germanotta. Set aside 6 or 8 strawberries. Hull and slice the rest. Whip 3 1/2 cups of cream until it just holds stiff peaks. Add the powdered sugar, vanilla, and whip to stiff peaks. Spread a small spoonful of whipped cream on the bottom of a 9×13-inch baking pan or on a serving platter. Place 6 graham crackers in the pan or on the platter. Lightly cover the graham crackers with whipped cream, sprinkle some chocolate chips on top of the whipped cream and then place a single layer of sliced strawberries on top. Repeat 3 times, until you have 4 layers. Spread the last of the whipped cream over the top and swirl it lightly with a spoon. Preheat oven to 350. Grease a 9X9 pan with butter. Lay 3 cooked lasagna noodles in the bottom of the pan. In a large bowl, combine the ricotta cheese, mascarpone cheeses, sugar, and egg, and beat until almost smooth, set aside. In another bowl combine the sliced strawberries, raspberries, blackberries and blueberries and try not to mash the raspberries. n another bowl combine the flour, brown sugar, cinnamon, nutmeg, cloves and melted butter. Mix to combine. 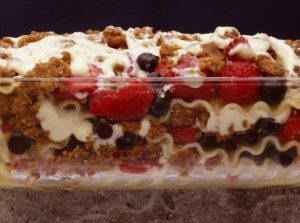 Top the layer of lasagna noodles with one-third of the berry mixture followed by one-third of the flour mixture and one third of the cheese mixture. Repeat, adding two more layers of all three mixes. Bake for 45 minutes in an oven until the top is golden brown and the filling is bubbling. Remove, cool for 10–15 minutes, and then serve with vanilla ice cream. Serves 8.